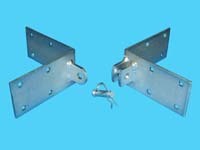 Dock Accessories | Floating Dock Brackets, Light Duty | VE-VE Inc.
Home :: FLOATING Dock Brackets ( #5B ) :: ( #2 ) D-400 Series. LIGHT DUTY. For FRESH WATER, Small Residential Dock Systems. D-400 Series; "FLOATING DOCK BRACKETS" For Floating Docks. NOTE; THIS SERIES OF FLOATING DOCK BRACKETS HAS A ZINC PLATED FINISH, SO THEY ARE "FOR FRESH WATER USE ONLY!!" on Small Residential Dock Systems. 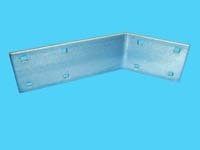 TO SEE OUR LARGER, MORE HEAVY DUTY, GALVANIZED FOR SALT WATER USE, FLOATING DOCK BRACKETS. GO TO OUR D3-400 SERIES FLOATING DOCK BRACKETS. ( CLICK HERE ) TO VIEW D3-400 SERIES BRACKETS. "T-Section Connector" ( 1 ea. Male & 1 ea. Female Connector, set also includes 1 ea. clevis pin & 1 ea. hitch clip ). Use to connect 2 floating dock sections together. 2 sets required to connect 2 sections together. NOTE: If using D-442; "Backing Plates" OR D-460; "Fastener Kits" with the D-420, you need 2 of either one per 1 ea. D-420; "T-Section Connector"!! 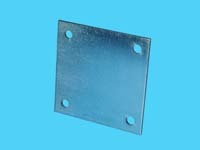 "Square Backing Plate" can be used with the D-420 "T-Section Connectors" as a back up plate on inside of dock section. "Corner Tie Section Connector" ( 1 ea. Male & 1 ea. Female Connector, set also includes 1 ea. clevis pin & 1 ea. hitch clip ). Use to connect 2 floating dock sections while also tying together corners of the dock sections. 2 sets required to connect 2 sections together. NOTE: If using D-435; "Inside Corner Supports" OR D-460; "Fastener Kits" with the D-430, you need 2 ea. D-435 or 4 ea. D-460 per 1 ea. D-430; "Corner Tie Section Connector"!! "Inside Corner Support" can be used with the D-430 and D-440. D-440; "Outside Corner Angle Tie"
"Outside Corner Angle Tie" can be used with D-435; "Inside Corner Support" or when a float is in the way the D-483: "Backing Plate" may be used. 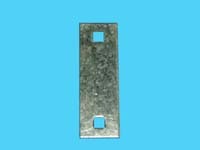 "Backup Washer Bar" can be used with D-444 "Stringer Angle Bracket"
THIS ITEM TEMPORARILY OUT OF STOCK UNTIL FURTHER NOTICE, SORRY!! 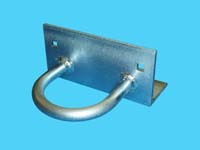 "Floating Straight Bracket" works with dock pipe UP TO 2" ( 2-3/8" O.D. ) to stabilize floating docks or use bracket as a tie off for anchoring floating docks or swim rafts. 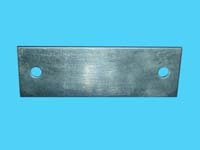 "Rectangular Backing Plate" can be used with the D-450 & D-452; "Floating Straight Brackets" or the D-550 & D-555; "Straight Brackets" as a back up plate on inside of dock section to add more bracket mounting support. 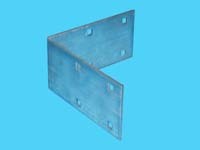 D-480; "Dock Ramp Hinge Kit"
"Dock Ramp Hinge Kit" is used for the first dock section ( RAMP ) when the shore level is higher or lower than the main dock. Kit includes 4 ea. plates and mounting fasteners. 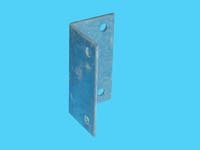 D-486; "Corner Support Bar Assembly"
The D-486; "Corner Support Bar Assembly" is used to help stabilize and support inside corners created when building docks with a T or L shape to them. 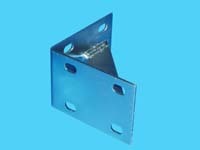 D-445; "45 Degree Corner Bracket"
The "45 Degree Corner Brackets" are used to attach and stabilize a 45 degree inside corner dock section to your dock or to mount a 2" x 4"/6" inside corner brace. 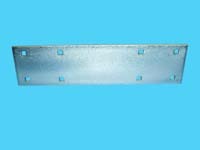 "Section Tie Plates" are used to connect 2 ea. dock sections together. Use 2 ea. PER SIDE if sections are open ended, use 1 ea. with 2 ea. D-435; "Inside Corner Supports" or 2 ea. 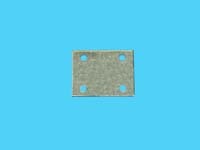 D-442; "Square Backing Plates" PER SIDE if secton ends are closed. 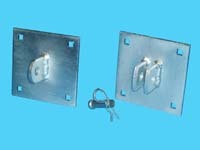 The "Backing Plate" can be used with the D-445; "45 Degree Corner Bracket" or the D-485; "Section Tie Plate" as a back up plate on inside of dock section. Made of 3" W. x 4" L. x 12 ga. Th. galvanized sheet metal. D-507; "Sand Auger" ( For 1-1/2" Pipe. ( 1-7/8" O.D. )).